A Las Vegas favorite, Off the Strip offers classic bistro and comfort food. Brunch is served daily from 5 am – 2 pm. Steaks, chops, pasta and burgers as well as Italian specialties are the highlight of the menu. Don’t miss out on the bottomless cocktails at brunch. 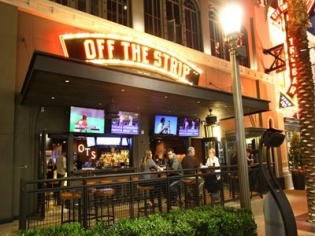 This two-story Off the Strip located on the Strip features three bars, and both indoor and outdoor dining. Chicken Parmesan and lobster ravioli are customer favorites. This is a favorite of locals because of the great service, the delicious food and the talented bartenders. Don’t forget to try the $25 ribeye special during the Happiest of Hours 2pm – 5pm and 12am -3am! And save room for dessert, their cheesecake is one of the best around.